When I formed a partnership between ACCESS Event Solutions and the National Sports Forum in 2004, I knew there was great opportunity. Not only have I found a way to work with many of the biggest names in the sports industry but I've also made several lifelong friendships in the industry. It was guys like Dan Migala who inspired me to think like a marketer. Doing business with GMR Marketing taught me the ropes of sponsorship activation and creating brand affinities. And Bonner Paddock helped me realize how I could make a difference on a global scale. In 2008, Bonner became the first person with cerebral palsy to summit Mount Kilimanjaro. 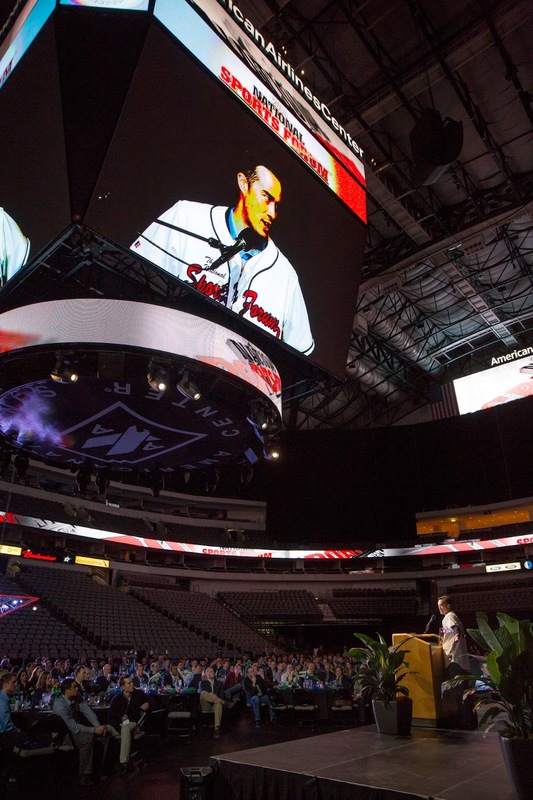 The 2009 National Sports Forum was held in Glendale, Arizona with keynote speeches lined up for Bud Selig, the commissioner of Major League Baseball, and NHL Legend, Wayne Gretzky. After a long drawn out speech by Bud Selig, a video began to roll with a man who had a pigeon toed limp climbing Mount Kilimanjaro. This man was Bonner Paddock who became the first person with cerebral palsy to summit the mountain. After the video, Bonner revealed his mission to raise $1,000,000 to help kids with disabilities from across the globe. There wasn't a dry eye in the room when he announced his organization, the One Man Foundation. I was inspired and began to think of what I might do to celebrate my 10th year of brain cancer remission in 2010. I decided to register for my first Ironman Triathlon in 2010, and raise $10,000 for a charity that was yet to be determined. In prior years I rode many century bike rides, and competed in several shorter distance triathlons. My body and mind were already familiar with the sport. The name of the foundation would be My Hometown Heroes (MHH), in honor of those who were their for me during my battle through brain cancer; they were my heroes. Not long after I registered for Ironman Canada I met with a few trusted colleagues. After bouncing around a few ideas it was decided that My Hometown Heroes would become a scholarship fund for young adult cancer survivors. Great sports organizations celebrate traditions and The National Sports Forum is no different. At 5 years with the Forum you receive a commemorative watch. 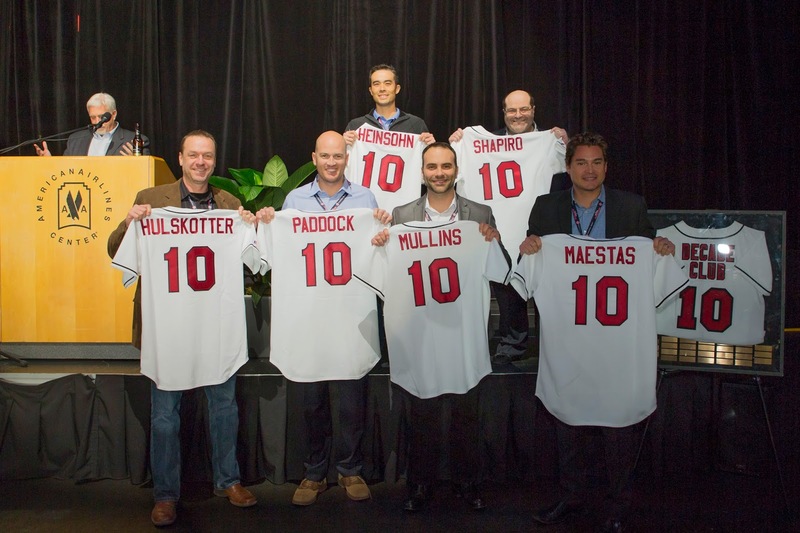 At 10 years, you receive a really cool National Sports Forum baseball jersey with the number 10 on the back and your last name. 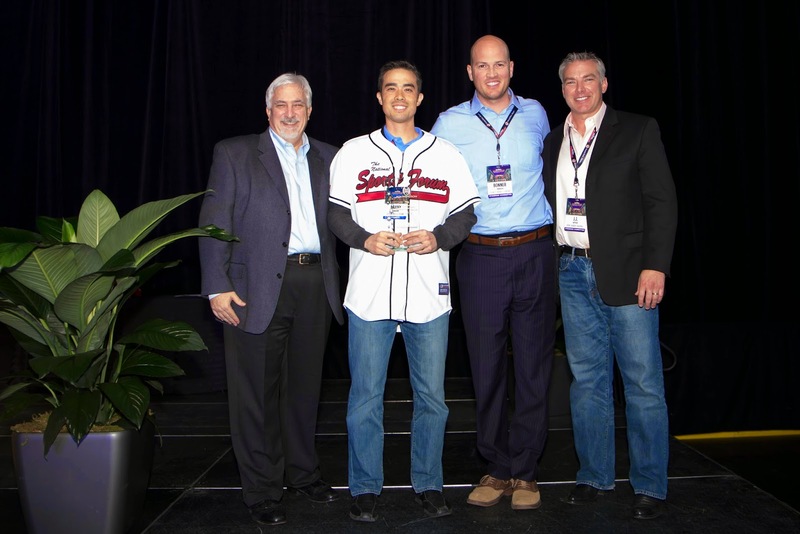 At the 2014 National Sports Forum in Dallas, Texas I looked forward to retiring/receiving my 10 year jersey as a proud partner of the event since 2005. It was a privilege to stand by my fellow Forum brothers to receive this honor. But that was only the beginning of an unforgettable evening. I self published my book, For A Reason, at the end of 2013 with hopes that I might get a plug at the 2014 National Sports Forum in Dallas. I didn't set any expectations but I do know you don't get what you don't ask for. I received 4 advance copies of the book in the Fall of 2013 and sent copies to the president of the National Sports Forum himself, Ron Seaver, and Bonner Paddock. Ron left me an impressive voicemail congratulating me on the achievement. Bonner was stoked because of personal experiences we shared in the industry. I brought about 16 books to Dallas because various Forum friends expressed interest in receiving a copy. I only sold a few before the Budweiser Gala. I sat next to Caitlin from the Milwaukee Brewers and Amy with the Oakland A's at the gala. By the time film started to roll for Bonner's achievements, I concluded that the Forum didn't have time to fit my book in the format. But when Bonner began to talk about the inaugural OM Foundation Award, I had no idea it would be for me until he started reading a passage from my book. It was then my heart began to race and I could barely contain myself from trembling with anticipation. It was like being dealt a royal flush on the flop in a game of Texas Hold Em. Finally Bonner announced my name to receive the award and it seemed surreal. I honestly didn't have a speech planned as I tried to think of a couple lines from Anchor Man, when Ron Burgundy gets called to play jazz flute for Veronica Corningstone, "Really, I'm not prepared". But I couldn't get it together. When I stepped on stage to accept the award I hugged Ron Seaver, JJ Gottsch with Ryan Sanders Baseball was next, and finally Bonner. It was obvious I had to give the speech I hadn't prepared; but that's exactly how it was planned. 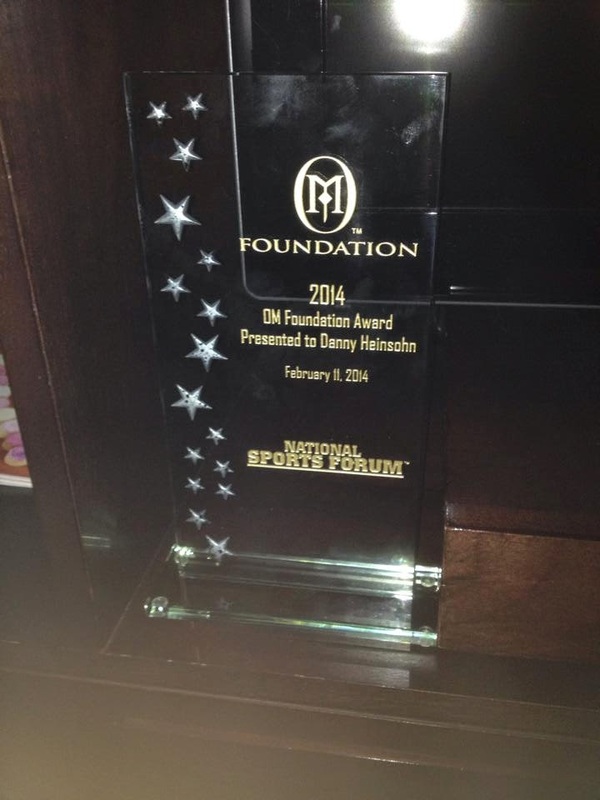 The OM Foundation Award was created in June 2013 at the National Sports Forum Executive Retreat, and I was the unanimous choice among all Steering Committee members. Somehow they managed to keep it a secret from me for over 7 months. In proper fashion, the remainder of the evening took place at the hotel lobby bar, with several meet & greets, hugs, handshakes, and yes I sold the remainder of my books I brought with me. 1. In my book, For A Reason, I emphasize the importance of community to achieve success and to find resolve through tough times. It's through our communities that we are able to create opportunities. And more importantly, it's our personal obligation to make the most of those opportunities. 2. Always do the right thing. You never know who will be inspired by your actions.